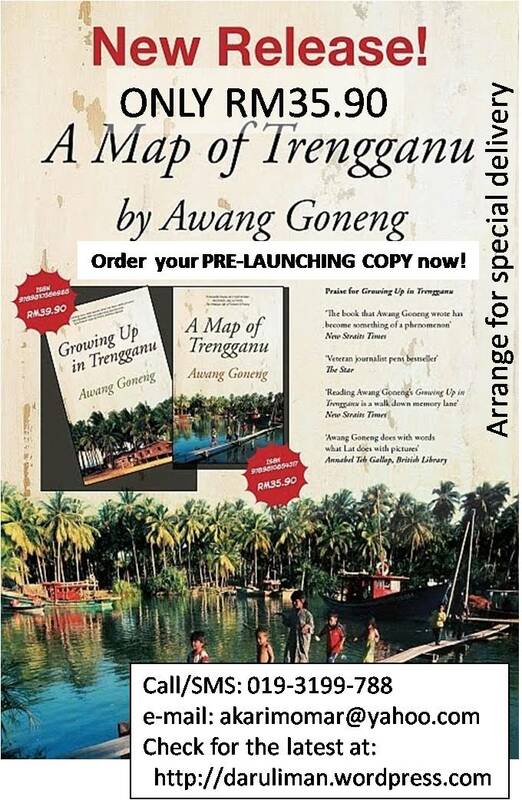 Uncle Awang Goneng’s latest book, A Map of Trengganu is finally out! This morning, I went out with my father to pick up the books from the country distributor and helped dad with our first batch of deliveries. I've got my copy... Have you got yours? Anxious to be one of the first people to read it, I quickly picked up a copy from the box as soon as we reached home. Soon, I was too engrossed with the book that when my mother called me to help her with the chores, she was shocked to hear me laughing alone. At that very moment, I was reading the part when Awang Goneng ‘took a Law degree “from the Academic Registrar’s office one night when the door was left open”. ‘A Map of Trengganu’ proved to be as beautiful and fun as its prequel ‘Growing Up In Trengganu’. Since the book had just arrived from Singapore, (as for today) there is a big chance that you may not be able to get them from the bookshops in Malaysia yet. But you can calm those restless, fluttering butterflies in your stomach by ordering them straight from ‘The Pizzaman’ (who happens to be my father 🙂 )!